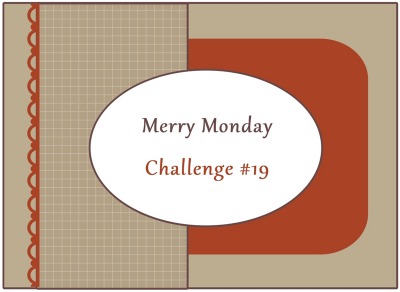 Today's card is for the Merry Monday Christmas challenge and also for the Jingle Belles challenge. I love this set and wanted to use it and so instead of using the oval shape from the sketch I went more rectangle and just rounded the corners to try and stay close to the sketch. 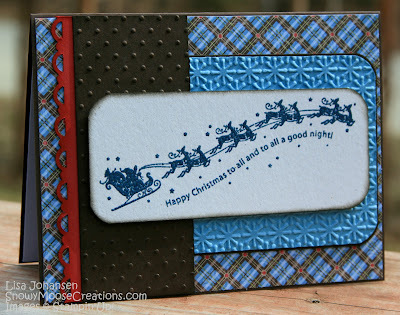 The Jingle Belles challenge is to use embossing, either dry or heat, and for this card I used both. The image is heat embossed with a dark blue embossing powder and then the 2 panels behind the main image are dry embossed. Very nice, Lisa! I love your papers and the sentiment goes perfectly with the papers. Masculine, yet sweet! Beautiful card Lisa! Love the pattern paper and the embossing folders. I might have to get that Sunburst. It is so pretty on the blue paper and looks like snowflakes. Also love the blue embossing powder. What a fab image that is. Love the elongated panel take on the sketch. What a great card Lisa :) I love the embossing folders you used and good call on the dsp! I bought that embossing folder because I saw you use it (and I love it) ... I also adore that fabulous image ... so very glad you joined us at jingle belles. I so wish I had bought this set when it came out....I've regretted it ever since! I LOVE this---your colors, embossing, textures.....just wonderful! Thanks for playing with the Merry Monday sketch this week! Wish I bought that image when it was available. You have showcased it so well. I love the embossing and fun colors too. Fabulous card, I love these colours. Thank you for playing Merry Monday. oh ♥YUM♥!!! what an awesome take, first of all, on that gorgeous sketch... but then a BRILLIANT use of BOTH kinds of embossing... and also just a flat-out ♥FABULOUS♥ holiday card by anyone's standards! i especially love that stamp and the fact that you inked and embossed it in that lovely BLUE (where i'd've gone for boring old black or brown!) makes it POP soooooo wonderfully well! Great mix of papers and embossing, that image is one I wish I had bought! Love the simple stamping you did Lisa, a really perfect Christmas card! Thanks for joining us at Merry Monday!